Joel Embiid often compares his life to a movie. Exactly what type of movie — fairy tale or horror film — depends on the time period over the past seven years. The Philadelphia 76ers center started at age 15 in perhaps a fairy tale. It next became a horror movie for personal and physical reasons. And now, with the arrival of his first NBA game in his third season, the 7-footer from Cameroon appears to be having a Hollywood ending with several sequels yet to come. 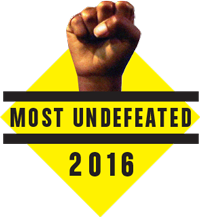 “My life is a movie,” Embiid, 22, told The Undefeated on Tuesday. “I started playing basketball at 15, which was in 2011. Just coming to the States, not knowing anything, no English, not knowing anything about basketball. I always say my life is a movie because everything happened so fast. Embiid was born in Yaoundé, Cameroon on March 16, 1994. He originally had dreams of being a professional volleyball player, but started playing basketball at age 15 with a close eye on mimicking Hall of Famer center Hakeem Olajuwon of Nigeria. Embiid was discovered at age 16 at a basketball camp hosted by current Los Angeles Clippers forward and Yaoundé native, Luc Mbah a Moute. With Mbah a Moute later serving as a mentor, Embiid moved to the United States at age 16 to play high school basketball. As a senior at The Rock School, a Christian academy in Gainesville, Florida, the five-star recruit led the school to a state championship and signed with University of Kansas. 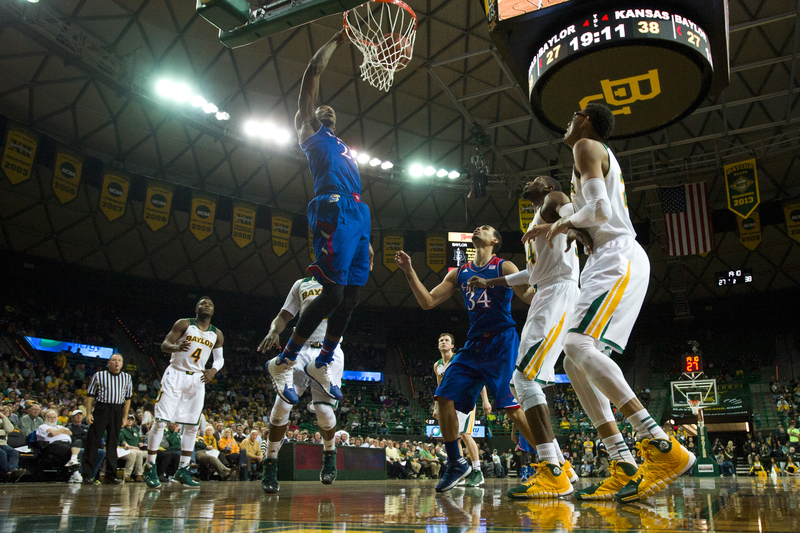 Joel Embiid #21 of the Kansas Jayhawks dunks the ball against the Baylor Bears on February 4, 2014 at the Ferrell Center in Waco, Texas. Embiid averaged 11.2 points, 8.1 rebounds and 2.6 blocks as a freshman during the 2013-14 season with Kansas, but missed the NCAA tournament due to a stress fracture in his back. Despite surgery on his right foot six days before the draft, the Sixers drafted him third overall in 2014. Embiid ended up missing the 2014-15 season due to the broken navicular bone in his right foot. The pain of missing his rookie season didn’t compare to the hurt Embiid endured when his 13-year-old brother, Arthur, died on Oct. 16, 2014, after being hit by a truck. Brown, then-general manager Sam Hinkie and Mbah a Moute, who was then with the Sixers, missed an exhibition game with the Boston Celtics to console the 20-year-old. Embiid went to Cameroon to attend the funeral of his brother, whom he had not seen since he emigrated to the United States. He said he thinks about his brother every night when he prays. Embiid also missed his second NBA season after having surgery on his right foot on Aug. 18, 2015. There were questions about his weight and work ethic. He raised eyebrows for rehabilitating in Doha, Qatar, at an orthopedics and sports medicine hospital. Embiid did not play during the NBA summer league in July either. Outside of the Sixers, optimism was low. With the Sixers’ reputation as the NBA’s worst team, Embiid felt he took “unfair” criticism for missing his first two seasons to injury. “As athletes, we can’t control it,” Embiid said. “Having fans and everybody in your ear talking about, ‘You haven’t played a game.’ or, ‘You’re always hurt’ and other stuff. It was hard. Embiid finally wore a Sixers uniform for the first time during a preseason game against the Celtics on Oct. 4. He showed promise, scoring six points, four rebounds and two blocks in 13 minutes. Embiid proved that he had potential to be a force in the last five of the seven preseason games he played, averaging 13.8 points and seven rebounds in just 15.6 minutes per contest. 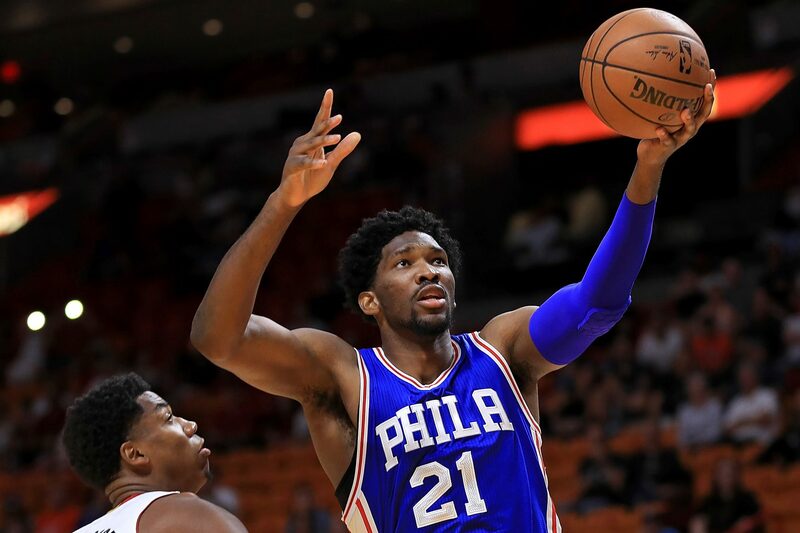 Embiid saved his best preseason contest for last, earning 18 points on 8-of-16 shooting and nine rebounds in 18 minutes during a 113-110 win over defensive-minded center Hassan Whiteside and the Miami Heat on Oct. 21. With that performance, Embiid instantly went from bust to a potential NBA Rookie of the Year candidate. Joel Embiid #21 of the Philadelphia 76ers drives on Hassan Whiteside #21 of the Miami Heat during a preseason game at American Airlines Arena on October 21, 2016 in Miami, Florida. “He’s got such a variety of ways to score that I can’t really point at someone and say, ‘He’s really like this,’ in totality. He does pieces of different people,” Brown said. Embiid joked about his minutes restriction when the possibility of being a NBA Rookie of the Year candidate came up. Brown will limit him to five, four-minute stints per game for the time entering the season. There is no definite timetable for the minutes to be increased, but health and performance could help his cause. “I want to play more. I want to help the team win. As long as I am on the court, I think I can help the team win. I got to do whatever they want me to,” Embiid said. Heralded Sixers rookie forward Ben Simmons, the top pick in the 2016 NBA draft, might have received more NBA Rookie of the Year buzz if he didn’t suffer a broken bone in his right foot. The former Louisiana State star is expected to return to action at the beginning of the year. After having his spirits challenged for two years, Embiid has been trying to lift Simmons up. Sixers and NBA fans will finally get to see Embiid debut Wednesday night. With a life reminiscent of a movie, he is hoping for rave reviews against the Oklahoma City Thunder and for many games to come.